Here’s my confession. I do not know everything. For example, until very recently I had not even heard of the following establishment in Sussex – which I now regard as one of England’s most impressive country house hotels. I was staying at the Grand in Eastbourne and picked up a leaflet about another property in the small group known as Elite Hotels. The photographs impressed me at once. I love Victorian buildings, and here was a sprawling stone mansion of the 1860s, complete with a gothic chapel, set in 186 acres of East Sussex. In as much time as it takes to start the Silver Cloud – and, these days, the old dear’s V8 is not as quick to fire as it might be – I was trundling towards Forest Row, near East Grinstead, about 1½ hours from London. Arriving at Ashdown Park was a treat. The drive is long and winding and downhill. As the Royce and I lurched sedately down the slope, I admired the carefully groomed grounds. Then the long grey house came into view, seeming to stretch forever in both directions, and appearing to accommodate far more than its 107 rooms. (I learnt later that much dates from the 1920s, when the original manor house was expanded to serve as a convent – but the whole complex looks much of a piece.) We stopped under the porte-cochère and liveried porters hurried out to deal with the globetrotters in the boot. Inside the galleried hall, I was greeted by a smiling lady at reception and was soon climbing the stairs to my first floor billet. Thick carpeting and greetings from passing members of staff (of whom there were many) eased my way. Double rooms here start at £165 a night, including breakfast, but I was in number 9, the Willow Suite – at £355 a night. The door from the corridor took me straight into the bedroom; from here it was three steps up into the sitting room and thence a door opened into the small, tiled bathroom. This sounds a slightly eccentric arrangement, but it surprised me how quickly I accustomed myself to it. I found my apartments light, spacious and very comfortable. Gently patterned wallpaper adorned the walls, green carpet was underfoot and a well-judged combination of wall lights and table lamps provided restful illumination. Pieces of Victorian mahogany furniture – I particularly liked the leather-topped writing table – seemed at home next to the pink velour of the sofa and easy chairs. Thoughtful touches were everywhere – a dish of good fruit, bottles of Hildon water, a safe, tea making equipment, Molton Brown toiletries, vases of flowers and a trouser press. And to prove it, I slipped into one of the three drawing rooms for tea. Quite a grand tea, as it turned out, with a glass of champagne, strawberries and cream, superbly fluffy scones, excellent meringues and cheesecake and a pot of proper leaf tea (Lapsang Souchong) – all for £23.50. I sat back on the pale green velvet of the sofa, in front of a blazing real fire, and enjoyed a doze. What would life be without these small pleasures? And what would it be without the appreciation of good service? At Ashdown Park I found every member of staff with whom I came into contact exceptionally courteous and helpful. Michael Purtill, the General Manager, is clearly doing a great deal right. For dinner it was to the large and busy dining room, called the Anderida Restaurant, to sit in an oak armchair (of the ‘baronial’ style) at a table with a white cloth, while a pianist tinkled the ivories. Chef John McManus has been here since the hotel opened 10 years ago. His style is straightforward, with good ingredients being used for a range of classic dishes. From his set menu (£35 for three courses) I chose – and enjoyed – marinated salmon with horseradish cream and lemon oil, beef Wellington with gratin dauphinois and (easily the star of the meal) a rich and deeply satisfying pineapple tarte tatin with passion fruit mascarpone. One aspect of the dining room is not up to scratch, however. The drinking glasses. They are of the cut-glass variety and are simply not up to the standard demanded by what is a seriously good cellar. Someone will have to pop out and buy some good glasses (Riedel, Spiegelau or Schott) – even if only enough are bought to deal with those who ask specifically for them. For there are some really great wines on offer here, from all parts of the world. And the greater they are, the more keenly are they priced. I spotted a fine vintage of the rich man’s claret, 1955 Pétrus, for £495, and the 1996 version of the best of the super Tuscans, Sassicaia, for £125 – both terrific value. And it was good to see some exceptional port – like 1945 Dow, at £449. Sommelier Richard Mitton brought me a big, alcoholic chardonnay from Argentina (Reserva, Moendoza, Finca Flichman, 2001 - £19.50), which I liked very much. The list is full of helpful comments, and I am happy to subscribe to its description of this bottle: “toasty-buttery nose… well-integrated oak flavours”. The New Zealand cabernet/merlot was less exciting, its depth of black fruit somewhat undermined – for my palate – by a degree of hardness in the mouth. Perhaps it needs a couple of years. Still, it made a pleasingly robust partner for the beef (C.J. Pask, Gimblett Road, 2000 - £28.50). Back in the dining room for breakfast – tasty smoked haddock and a terrific dish of stewed red and black fruit – I was so glad I had picked up that brochure in Eastbourne. I must still confess that I do not know everything. 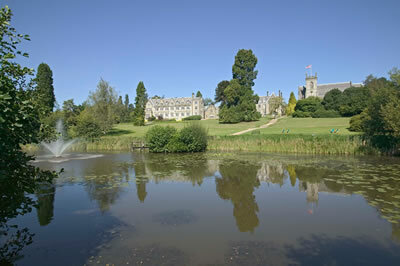 But at least now I know all about the wonderful country house hotel which is Ashdown Park. Wych Cross, near Forest Row, East Sussex RH18 5JR, England.